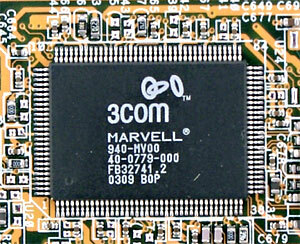 This is the first board of the new AI series. Let's see whether Artificial Intelligence is incarnated in this ASUSTeK's model indeed. The layout is not that bad, except maybe the audio-ins which are placed in front of the PCI, and connectors along the left side. It can be difficult to reach some jumpers when the board is already installed. Their functions are shown on the textolite. The 2-channel switching voltage regulator incorporates 7 capacitors of 1500 uF and 3 of 1200 uF. Also, there are voltage regulators for the AGP and memory buses. 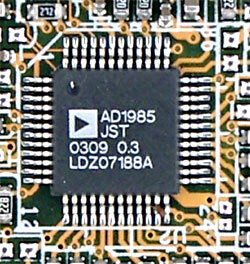 FireWire bus controller based on VIA VT6307 chip with 2 ports supported. 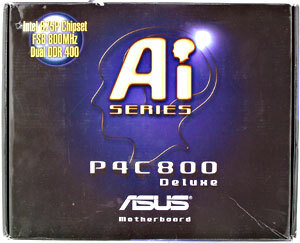 AI BIOS (CrashFree BIOS 2, ASUS Multi-Language BIOS, ASUS POST Reporter, ASUS MyLogo 2, ASUS Q-Fan, ASUS EZ Flash, ASUS Instant Music (for audio CD playback without OS booting)). +5 V supplied in the StandBy mode is indicated with the green LED. 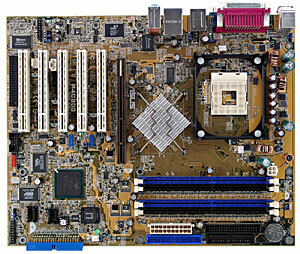 Brief board's characteristics: memory slots - 4 DDR SDRAM; expansion slots - AGP/ 5 PCI; I/O ports - 2 COM/ LPT/ 2 PS/2/ 8 USB 2.0 / 2 FireWire; dimensions - 305x245 mm. It's clear that the hi-end board has perfect functionality and a rich set of accessories. Also, I must say that this board justifies its name thanks to some really intellectual capabilities :).